There are all kinds of resources available to private Investors, and different strategies work best for different people. Some take the approach of studying finance and reading books to improve their own strategies. Others pore over news sources and watch CNBC to get a feel for the movement of the stock market and various impactful industries. However, for the more casual investor, there are now some less-involved options that can make certain types of investments far simpler. 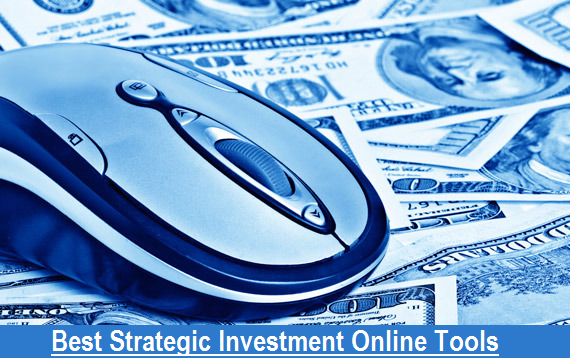 In this blog-post, we are providing a detailed Guide and Review on Top Four Best Online Tools for Investors on Strategic Investment and Financial Planning and Management. Specifically, there are a number of online resources and investment tools that can make financial strategizing and investing much easier for private investors. Here are a few such Tools you may want to be aware of if this sounds appealing. Acorns has been a trendy investor tool for about a year now, and it is a favorite starting point for some private investors who prefer to keep things relatively low-risk and effortless. The concept of the site is pretty brilliant: it taps into your daily purchases and extracts fragments of dollars left over, putting them into an investment portfolio. For example, if you buy lunch for $12.50, it rounds up to the nearest dollar, taking $0.50 to put into your investments. Your actual portfolio can be one of five different pre-bundled groups of investments ranging from "Conservative" to "Aggressive," with varying projections for net gain over time. Overall, it's a great tool for relatively carefree investing. Primarily a reference site with various insights on currency exchange and commodities, FXCM is a useful tool for those private investors who wish to keep things simple by way of steering clear of actual stocks. The main focus is on forex trading, which is basically the buying and selling of currencies against one another in hopes of a profit. Also, by providing up-to-the-minute charts on currency pairings, as well as online tools for the actual investments, FXCM makes this a fairly easy process. Unlike Acorns, it does require a good deal of knowledge and decision-making on the part of the user. However, it's still a method of investment that lets you buy and sell resources without diving into the full stock market, and this is a one-stop resource to help you with the process. One popular alternative to Acorns in that it simplifies investment for first-time private investors (or just those who want to keep things relatively easy) is Robinhood, which sets itself apart due to its lack of fees. Basically it's an online tool with an accompanying App that strives to be as comprehensive and easy to use as possible. There are no fees for making trades (and yes, there usually are with most services or brokerages), and you can manage your portfolio as you see fit, making investments in real stocks. Robinhood requires the most knowledge and personal time spent on stock market analysis out of any of these tools, but for those comfortable making their own trades it's well worth a look. Finally, there's Wall Street Survivor, which really has nothing to do with making actual investments. However, it is still an invaluable online tool for investors, particularly those just starting out. Basically, while it does offer various courses and sets of advice, the real utility of Wall Street Survivor is its stock market simulator. It's a sort of game that allows users to make trades and experience the environment of the stock market without actually risking money. It's a wonderful way to learn the ins and outs of trading, and something any private investor would do well to try, simply for the experience.